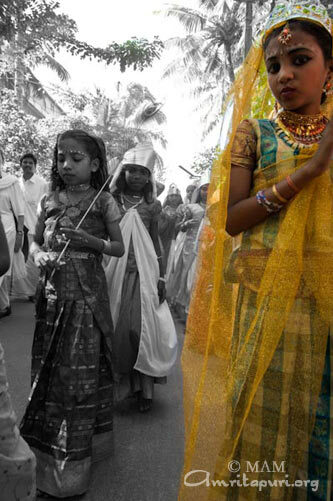 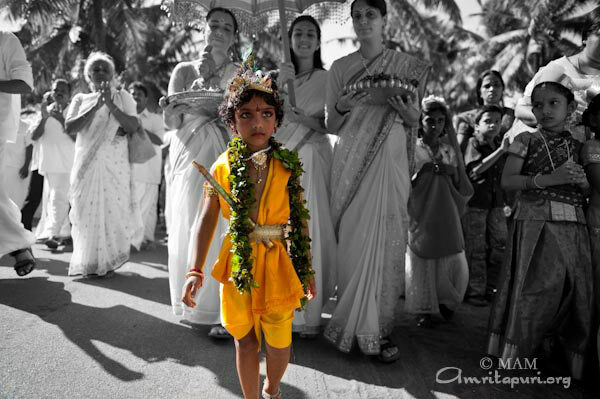 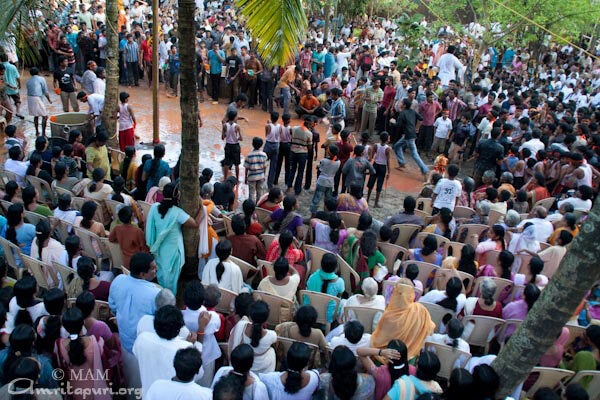 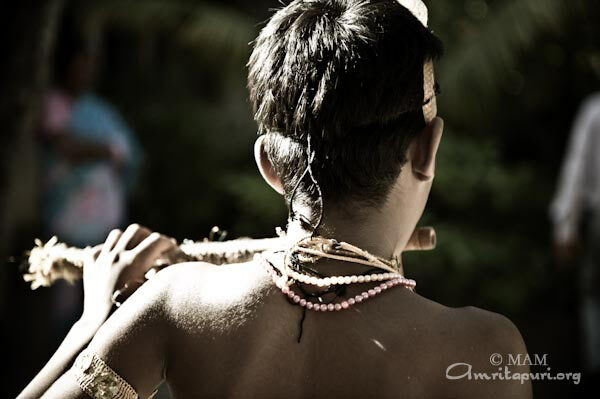 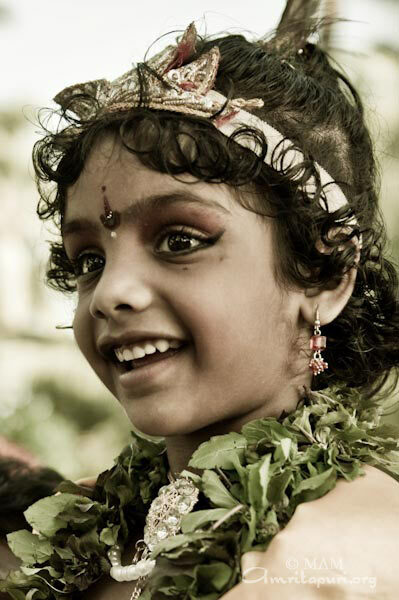 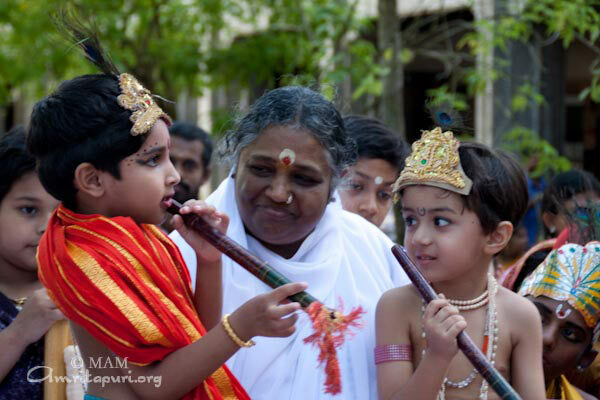 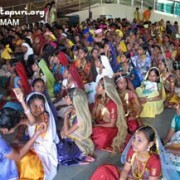 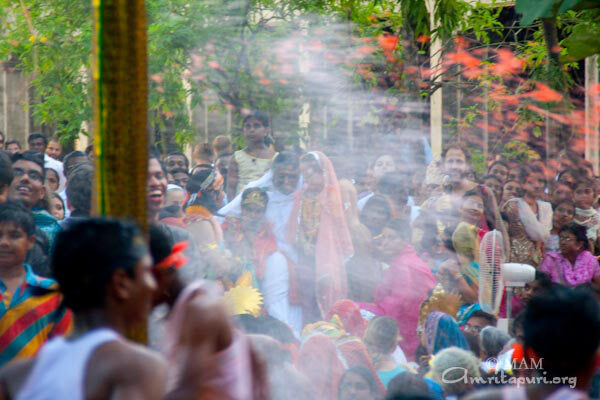 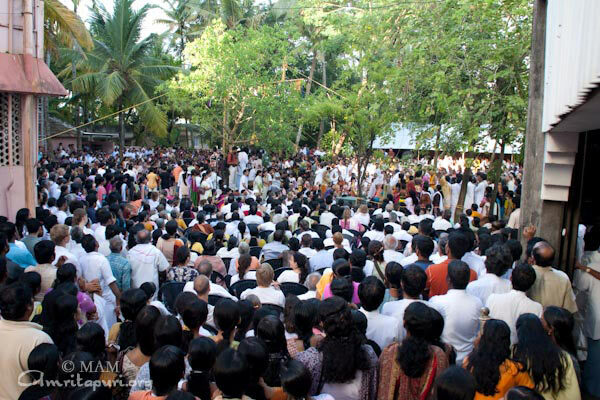 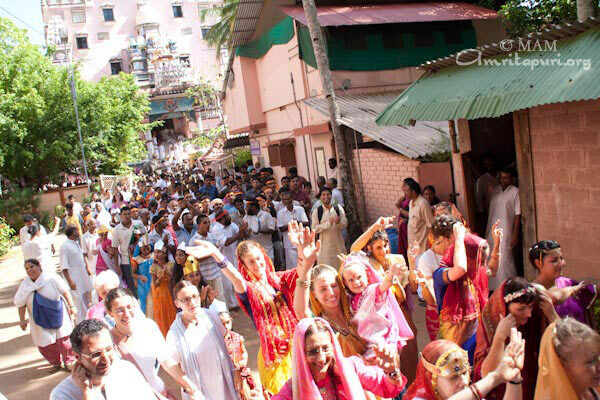 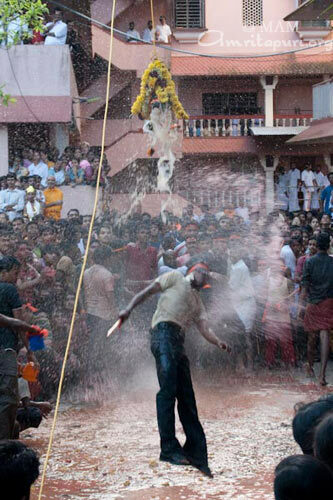 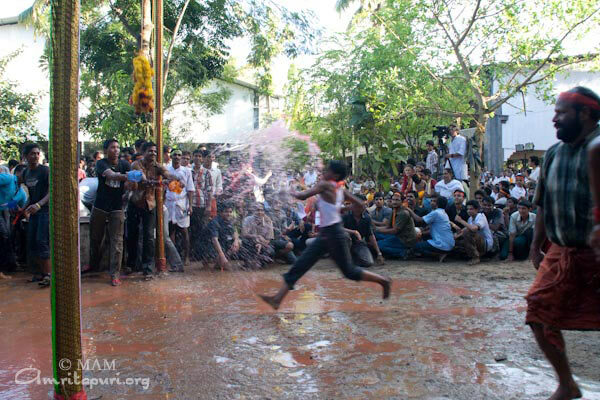 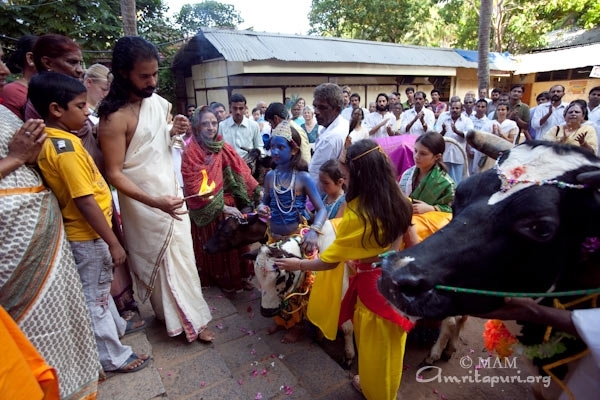 Krishna Jayanti was celebrated in Amritapuri will a full day of festivities. 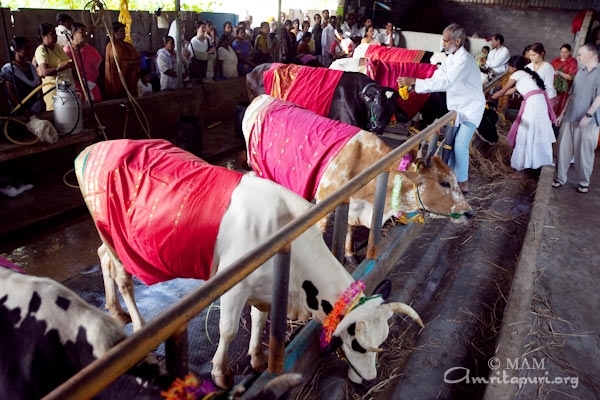 Beginning early in the morning, special pujas were performed, including the go puja, in which all the ashram cows were worshipped as embodiments of the divine. 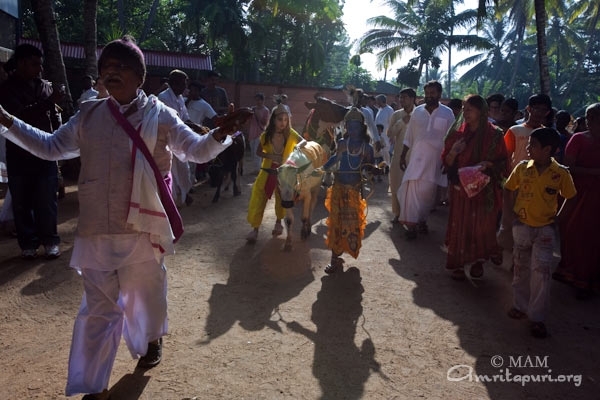 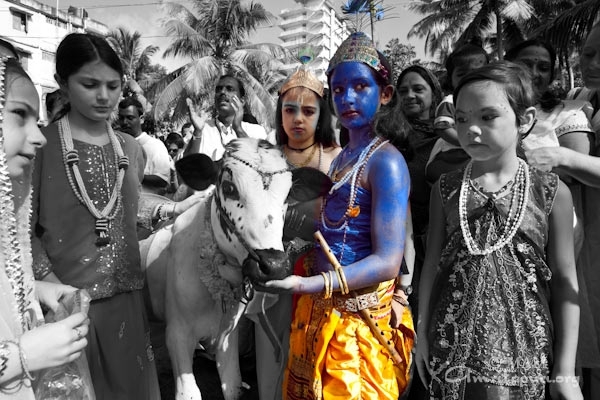 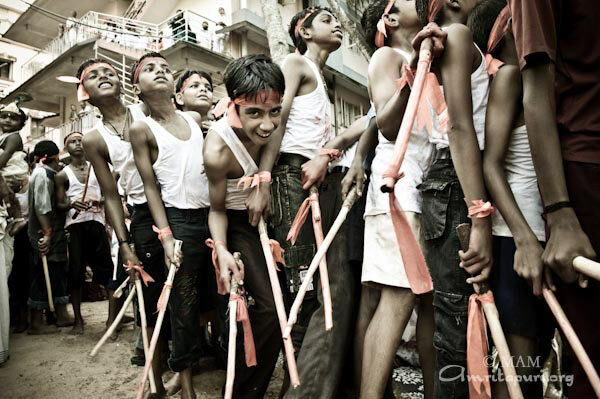 A few hours later—led by dozens of Krishnas, Radhas and gopis of all ages—there was a grand procession through the ashram on to the Kuzhitura Sri Krishna Temple, two kilometers away. 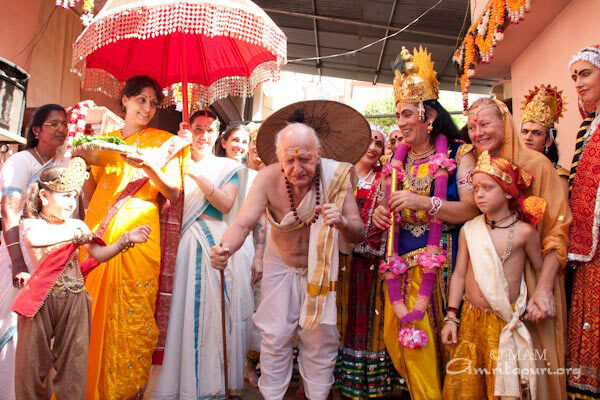 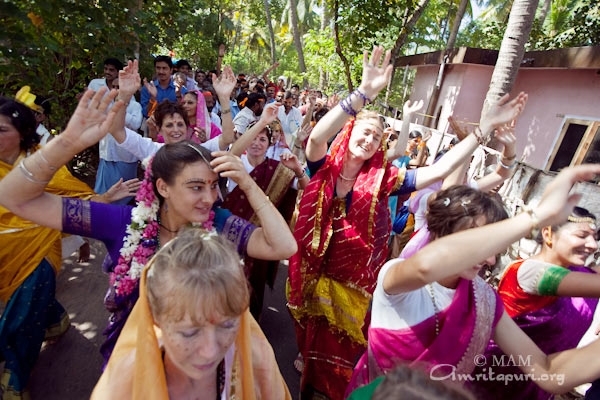 As the devotees walked, they sang lively, joyous bhajans. 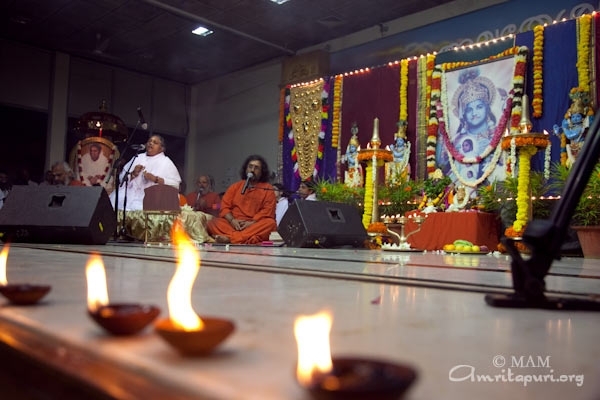 Normally, in Amritapuri, the conclusion of bhajans marks the end of the day, but on this night the main event had yet to come. 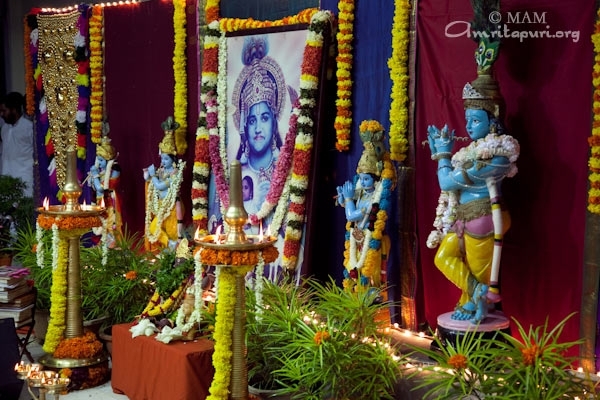 Just after 11:00 p.m. the doors to the main stage slowly opened to reveal a beautifully decorated scene with several images of Sri Krishna. 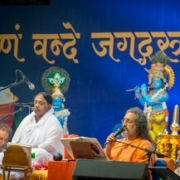 The bhajan hall was packed and everyone sat enchanted for the next 45 minutes, listening to a reading of the Srimad Bhagavatam, while bala-gopala puja was simultaneously performed. 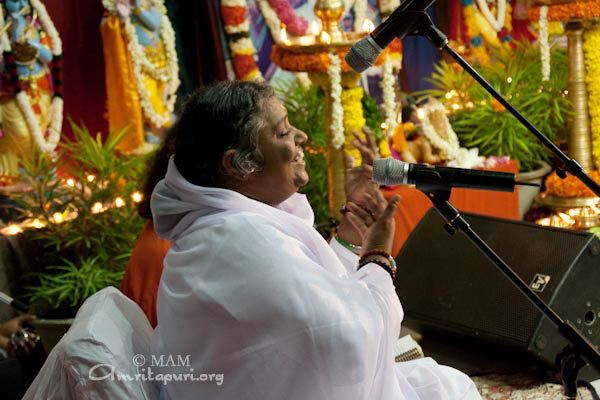 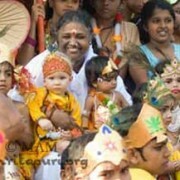 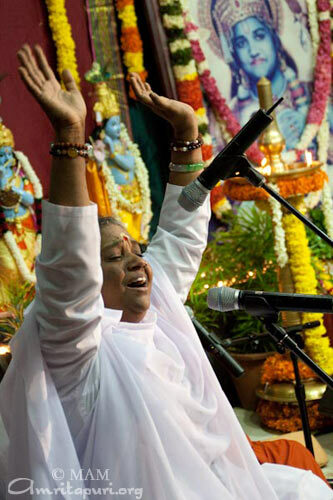 As the midnight (the birth time of Krishna) approached, Amma arrived on the stage. 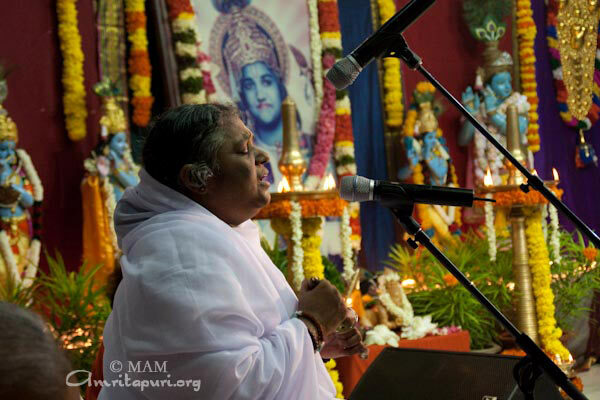 Amma took her seat on the stage, seemingly engrossed by the beautiful recitation of the childhood lilas of Krishna. 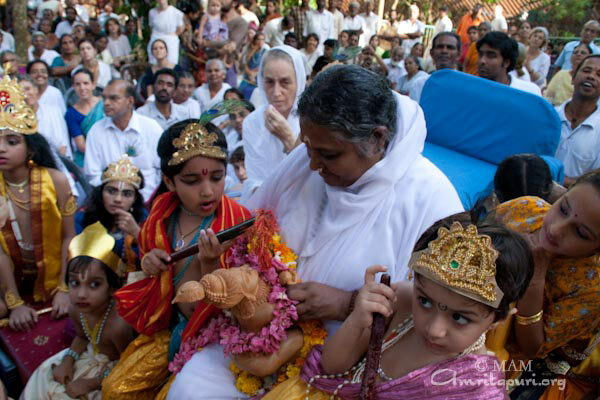 When the clock struck midnight, a small statue of baby Krishna was brought before Amma, so she could offer honey to the Lord, marking the moment of Krishna’s birth. 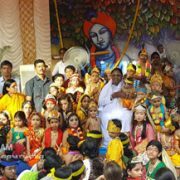 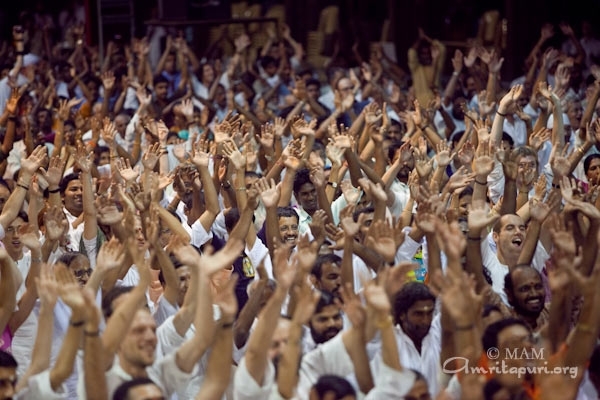 Amma then proceeded to singing several Krishna bhajans, including “Agatanayi,” “Nanda Gopan Tapamirunnu,” “Katti Tair Taram” and “Vande Nanda-Kumaram.” Finally, Amma asked everyone to stand, raise their arms skyward, forget all their troubles and blissfully dance. 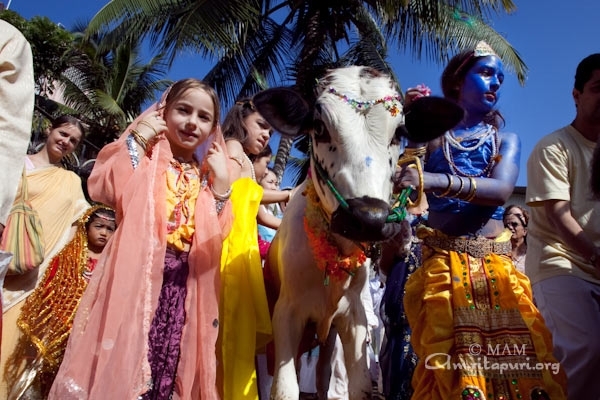 She then sang “Gopala Nacho Nacho.” Everyone danced as one—the song’s tempo went faster and faster. 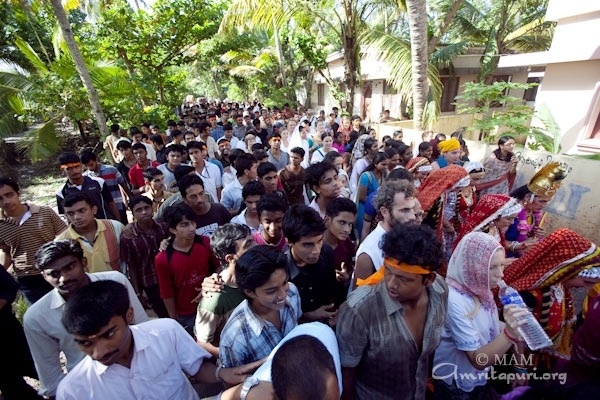 It was like rasa-lila. 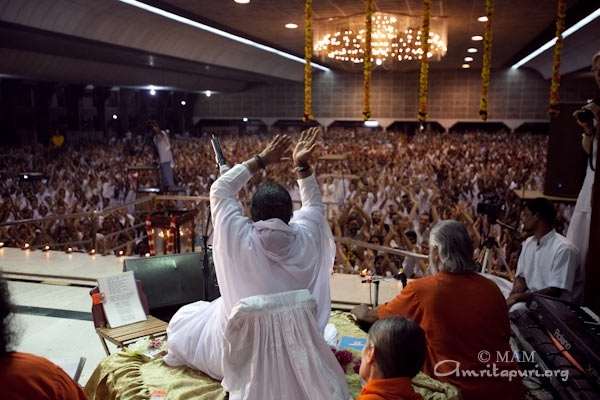 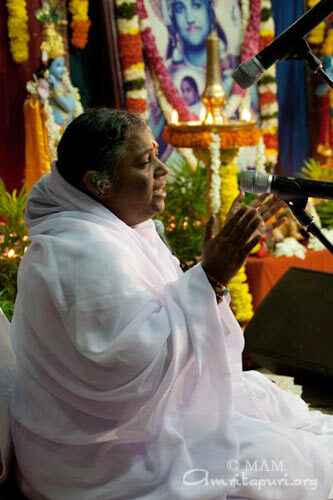 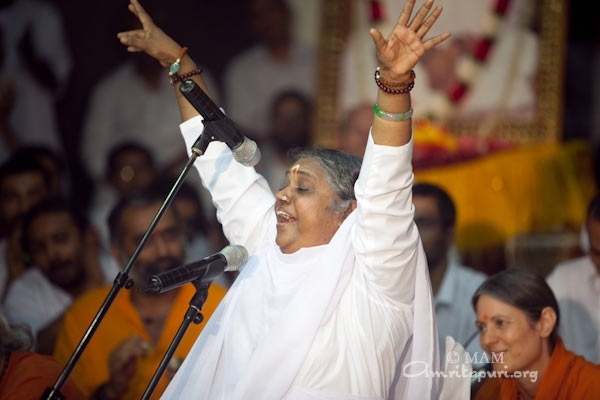 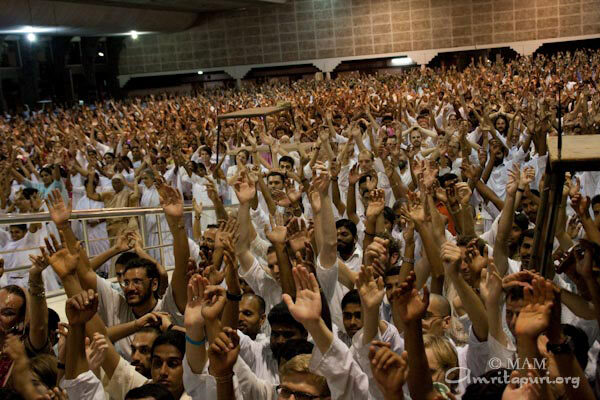 Thousands were dancing with Amma—together, yet alone. 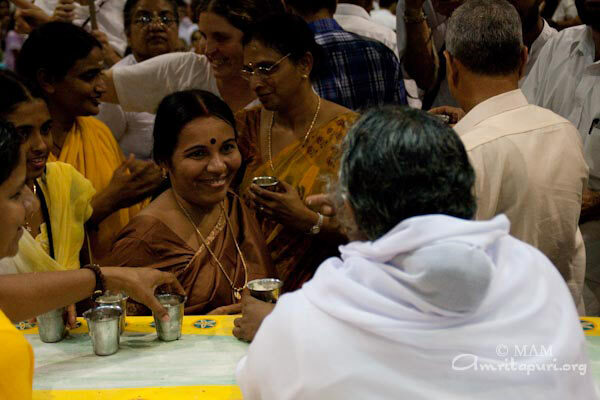 Before chanting the peace prayer, Amma told everyone “God should take birth in our heart.” To end the celebration, Amma distributed payasam as prasad to one and all.